In our earlier article, we discussed the trend of household savings in Nepal and how only 46% of the adult population in Nepal managed to save money in the past year. 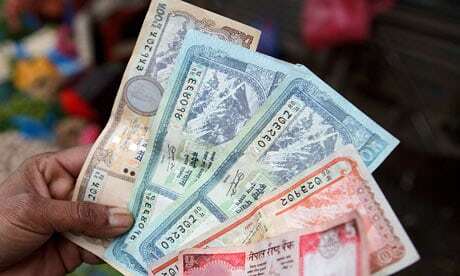 In this article, we discuss the trend of borrowing and overall household finance in Nepal. Some have turned borrowings into investments. 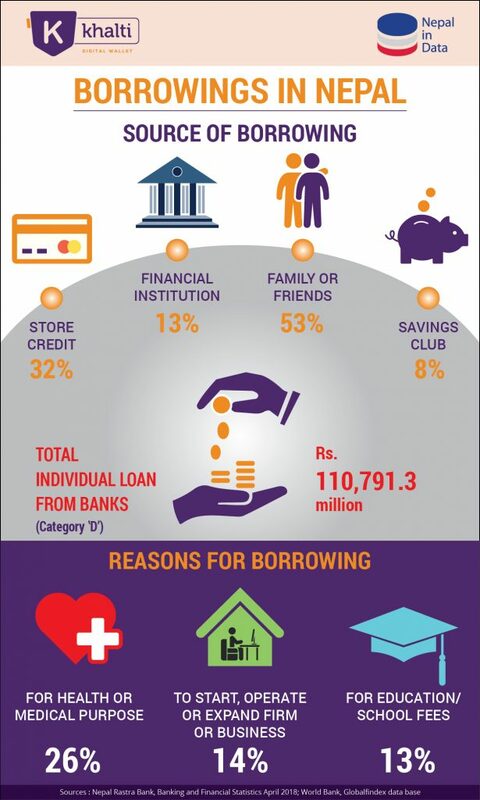 The above figures show that majority of us borrow (or take loan) from friends and relatives. It does not give a good signal, as the interest rate is very high – as much as 36% per annum – while borrowed through such informal channels, compared to average bank interest rate of 8.5% to 13% – depending upon banks. Household finance in Nepal: Why do people borrow from informal sources? Nepali households continue to have high levels of unsecured debt from informal sources like moneylenders, putting them at risk of falling into a debt trap. Especially in villages, people take loans at usurious rates from money lenders for various purposes like wedding and other ceremonies, medical emergencies, or fly to abroad for work or further education. Such a dependence on unsecured loans leads to higher costs and traps households in a long cycle of interest repayments. Numerous Nepali novels and films entail stories of such traps from in our society where feudalism is still prevalent where mukhiyas (headman of village) lend to the poors. The reason why these households prefer informal sources of funding is because they either don’t have access to banking, or banking literacy, or feel dealing with bank a very complicated paperwork. A large number of Nepalis are without bank accounts and hence no access to formal financial services. Even among the working class who have bank accounts, that gap still exists because of lack of financial literacy and awareness. Why is the domestic borrowing in Nepal increasing? In recent years, Nepalis’ lifestyle has been hugely influenced by modernization and rapidly growing consumer culture. People today want to lead a life full of luxury and comfort. With per capita income growth, consumption habit has also increased. And, as banks have eased loans on auto, housing and similar other topics, household borrowing has soared. In recent times, there has been a significant decline in the reliance on moneylenders and more households are borrowing from banks. To promote borrowing from banking channels, complicated paperwork and bureaucratic impediments should be reduced, by ensuring that the terms and conditions of financial products are made simple and intuitive to the debtors. Access to banking and financial literacy will enable to make borrowings (take loans from bank), and help economic activities thrive and boost micro, small and medium enterprises, ultimately alleviating poverty. Financial inclusion will foster empowerment of women in rural areas as they can borrow money and save in financial institutions, and start enterprises.